The Courage to Be. Several months ago, a friend of mine who I really look up to shared this little quote with me. More of a mantra really. It really struck a chord with me right from the beginning. I now wear a bracelet with this phrase on it. For me, it has become a powerful reminder of — well, the weakness and strength within all of us. It helps me remember that I have a choice in how I percieve thing, how I percieve myself. And that sometimes it really is nothing but sure courage that gets you through the day, courage to live according to your own beliefs, courage to breath, courage to live. The Courage to Be. Today was my last day here in Medellin. A day filled with saying goodbye. I was not all that horribly sad to say goodbye to these guys, primarily because I know that I will be back here in a few months. I had bought a few presents- stickers and bracelets- and passed them out of everyone. This is ALWAYS an incredible experience. An experience that starts with all 40 sitting down patiently… and then within minutes a whirlwhind of hands grabbing, screaming from all directions, pulling on your clothes, your bag is off your back (you hope that was done by an adult)– you look down and you don’t know who has what, what has who… or what this little project you started even was. Then you are rushed with hugs and kisses and gracias and adios and caio and te quiero. And as quickly as it started, it is over and all have returned to the swingsets or climbing over whatever other precarious equipment is moderately accessible. 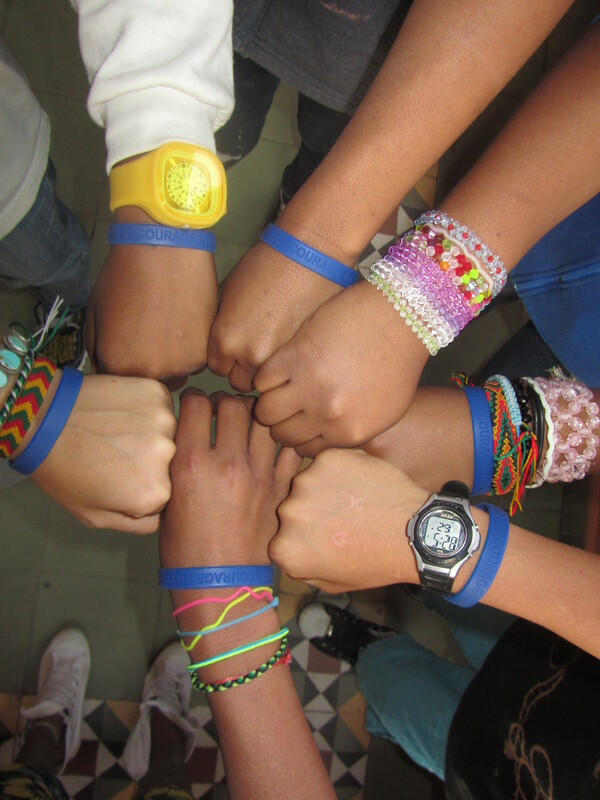 I gave the older kids at PAN courage to be bracelets. After it was all over, I went to find one of my good buddies who I knew I had no said goodbye to yet. I found him- he hollered down to me from the balcony. I smiled- “I’ve been looking for you.” He came down the stairs with a huge grin on his face. “Caio Keely” . I dove in for the big hug…. but, the strangest thing happened. He didn’t hug me back. It was not like he was being cold and not wanting to hug me. It was like this little boy really and truly didn’t know how to give me a hug. I almost started crying right in that instant. It was like his little body didn’t know how to respond. He hasn’t been at the orphanage long: 4 months maybe. What has happend in the last 13 years of this kids life that he can’t give a hug? Thats why I come here. I would like to say its therapy. But in these moments, when you come face to face with the reality of these kids lives. All you want to do is love them. I have realized more and more in my time here. It doesn’t really even matter what you do with these kids. For me its physical therapy. But I think more than that… the thing that I do that really helps them…. is the attention. its the love. its the 45 minutes a day with an adult who looks at them in the eye, expresses interest in them, laughs, acts silly, listens to them with undevided attention, hugs them, just providing them a safe environment– a place that allows them to discover, to really bask (even for just a minute) in being a kid, no worries, a moment of piece. And with the lives they have lead and the lives they continue to lead, it really is a struggle that I can’t even totally understand. they have lived through things as 9 year olds that I can’t even imagine at 29. and their courage to keep fighting, to keep living- their courage to be, well, it is garuanteed to change your perspective. This entry made me cry big ole tears as I think about that precious little boy. I hope he will be ok and learn how to respond to love. You are right. PT or anything that we do for others is just a lead into loving them in the moment and BEING with them. Did you get this entry to the person that first told you about the courage to be? I want her to read this and to know that she helped to inspire you. Love you so much and bought you some new shoes today! The courage to be….Great one! Im using this with my clients and in Powerful Axioms! Hope you are well! Thanks for updates KO! What a powerful mantra – The Courage to Be. You passed that on to those kiddos! They will understand and I know that they see that lived out in you – their example is you! I sure hope that boy hugs you when you see him in a few months – remember the huge grin on his face. What a glorious day that will be!